Tindaloo in CyberSpace: a Hug for you ♥ Playing with my INKs! a Hug for you ♥ Playing with my INKs! Can you tell that I've been playing with my awesome Dylusions ink sprays by Dyan Reaveley? If Tim Holtz is my King, then Dyan Reaveley surely must be the Queen of Scrap!!! Have you seen her videos on YouTube? I've been totally addicted to Tims tutorials for years ~ never been able to craft like him.. Keep on trying though! *lol* Go to his blog > here < for tons of inspiration and videos!!! ● 613 Avenue Create #58. ~ Anything Goes / Create Your Own Challenge! 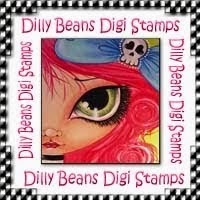 Stamps/Images: Dilly Beans '410-heart fairy framed' digistamp. Norsk Stempelblad ett Trykk 'Clearstamps tekst07'. North Star Stamps 'CS Bursdagstekster A5'. Magnolia 'BakgrundsSwirl Bröllup'. Elements like the tag and owl are from the Scrap Orchard Collab 'Our Life' - Snips and Snails Designs and Sugarplum Paperie. Dies/Punch: QuicKutz (aka. Lifestyle Crafts) 'REV Cookie Cutter nesting SQUARES-01' and 'Nesting Lace Squares DC0158'. EK Success Corner Adorner Medium Round Punch. Embellishments/Tools: Ranger Ink Dylusions ink sprays by Dyan Reaveley 'after midnight' and 'dirty martini'. Panduro Hobby - waxed linen thread/twine, and misc. blue beads. Heart bead from Nille, unknown pink Button. Rangers Glossy Accents. Scrapmagasinet 'half pearls bling'. Gluedots, foam 3D dots n tape. I used Twinkling H2o's and Tim Holtz Distress Ink pads to watercolor and distress image and papers. Your card is a delight Tindaloo, a most alluring facial image so cleverly combined with inks and colours. Like you I am a real fan of Dylusions and distress inks both of which are so versatile. Thanks so much for joining up to my blog celebration and good luck with the prize draws. Stunning. Great colouring, love the layers. Seen the video, wow just wow! He's indeed verry talented. Gorgeous card!!! Love the design and you beautiful coloring! So pretty. Thanks for joining us at Digi Haven. Miss Cupcake Gift-box & beeing Thrifty!